The combination of Aeon Melodic and Rhythmic is a sample-based winner for sound designers and musicians alike. Sounds superb. Excellent step-based manipulation. Plenty of effects options. Useful menu suite patches. Ready-made arp patches. Not suited to all genres. Can't tweak underlying sample set. Heavyocity's Kontakt instruments successfully straddle the worlds of sound design and music production, delivering powerful ready-made sounds with plenty of flexibility, ranging from soundtrack-style percussive stabs, hits and kits through to musical loops and playable instruments. Aeon comprises two Kontakt instruments, Melodic and Rhythmic, also available separately. You get 720 presets in total, and each of the two instruments has its own scripted Kontakt interface. There are many similarities between them, including three tabbed pages (EQ/Filter, Trigger FX and Main), and Twist (modulation) and Punish (saturation) effects processors, but Melodic is slightly more complex, allowing for three separate layered sounds per preset. Both instruments feature step-based manipulation via the Advanced Performance tab, in the form of Melodic's Arpeggiator and Rhythmic's Loop Mutator. There's also an Amp Sequencer for easy rhythmic level modulation. 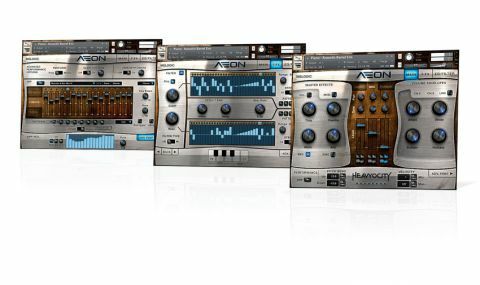 So, Aeon clearly offers plenty for tweakers, but what of the patches and sounds themselves? Melodic's 315 presets are split into Organic, Synth, Hits, Arpeggiator and Hybrid categories, with the Hybrids combining Synth and Organic sounds. As noted, all patches other than the Hits can combine up to three layered sounds, although only a few actually use all three slots. "The sounds have a slick, processed, hyper-real sheen"
While the source sounds appear on paper to be pretty commonplace (pianos, pads, tuned percussion, basses and leads), the processing and treatments applied place them firmly in sound design territory. Organic patches range from Kalimba Thumb Piano and Tank Drum to the amusingly named Cowbell Floaters and the 'advert-ready' Harp - Piano Swells. Synth sounds span the spectrum from bass roundness (Cloud 9) to pad heaven (Evolving Formant Pad). There are also some great ensembles, including the sinister Piano - Acoustic Barrel. The sounds have a slick, processed, hyper-real sheen that sets them apart from 'purist' sample libraries. Rhythmic's patches are constructed slightly differently, with nine top-level Menu Suites designed for loop auditioning and combining. Loops are arranged one to a key, with two octaves of keyspan at the lower end assigned to loop pitch control (+/-12 semitones). The loops also all come as self-contained sliced presets. With these, you can trigger both pitched playback of the whole loop (+/-12 semitones) and the individual slices that make up the loop. You can adjust tuning, panning and level for each slice, either in the main page or via the Advanced Loop Edit page, where you can also randomise these parameters. "It's great for soundtracks and sound design, but also for when you just want something a little different to throw into a track"
The Rhythmic patches vary considerably, from arp loveliness (Axel Foley 1) to slightly crazy (Guitarmonic Odd 3), and from destructive (Industonality) to plain excellent (Modular Braincell). The underlying source loops are already quite processed, though, which does limit them somewhat in terms of customisability. Aeon delivers an excellent palette of sounds. It's great for soundtracks and sound design, but also for when you just want something a little different to throw into a track. For us, it's the step-based effects that clinch it, bringing serious flexibility to an already brilliant sound set.